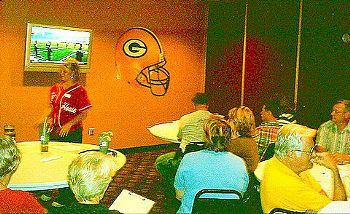 Photo from Dan and Marilyn Tye Following a Drums Along the Red Cedar 2007 planning meeting in a "Green Bay Packers Sky-Box," the "green and gold" gave way to the myriad colors of drum corps as several dozen fans watched the DCI finals on ESPN2 on screens throughout the Stout Ale House in Menomonie, Wis.
Photo from Lindsey Spangler This is "The DCI Crew". From left to right: Becca Silvas, Marlee Ingle (marched Bluecoats '05), and myself, Lindsey Spangler. Here we are chillin' while watching DCI on ESPN2. We all love to get together and watch DCI, whether it be the Classic Countown, Semifinals on my computer or Finals on ESPN2. 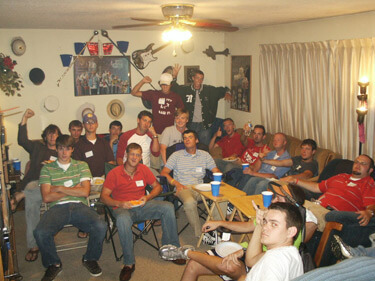 Photo from Floyd Stegall This is a photo of some of the active brothers and prospective members of the Alpha chapter of Alpha Mu Lambda Fraternity (University of North Alabama) enjoying burgers, brats and drum corps at the home of Floyd Stegall in Florence, Ala. We eventually had a total of 30 people watching the DCI Finals telecast with us! Photo from Emily Fetcho We call it "Drum Corps in the Dorm, Vol. 2 in 8 parts with a Door." Last year, the drum corps kids from Butler University in Indy got together to watch the ESPN broadcast -- we even had our picture on Forzato! We decided to gather again, but this time with a few more friends--that's where the eight parts comes in: We had eight corps represented last night! Much fun was had by all, even though the TV couldn't be heard for half of the broadcast because of all the banter. Thanks to all our drum corps groupies who came, too! Front row from left to right: Myself, Emily Fetcho (Mellophone - Phantom Regiment), Sam Bivens (Tuba - Cavaliers), Josh Scott (Horn Sergeant and Euphonium - Phantom Regiment), Christina Lear (Color Guard - Capital Regiment) and Phillip Weitlauf (Color Guard - Cavaliers). Second row: Dave Elliott (Baritone - East Coast Jazz), Evan VanDoren (Asst. Drum Major and Trumpet - Carolina Crown), Chris Hodgson (Snare - Capital Regiment), Bryan Byrer (Snare - Colts), and The Door. 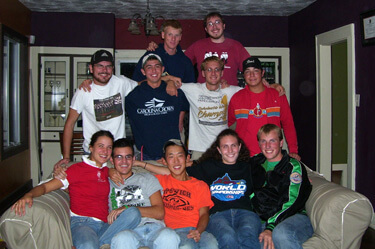 Third row: Chad Brinkman (Horn Sergeant and Trumpet - Carolina Crown) and Jon Flodder (Baritone - Madison Scouts Alum). Thank you so much! Thanks to everyone who sent us photos of your DCI on ESPN2 parties. Keep them coming to Forzato@DCI.org and we'll show as many as we can in the coming days and weeks!